◆This monocular features BAK4 prisms and multi-layer broadband green film that make your view wider, clearer and brighter by giving a superior light transmission and brightness.The edge has the design of eliminating light stripe, which can reduce eye fatigue. ◆22 MM OVERSIZED EYEPIECE: The size of the eyepiece is larger than other eyepieces at the same level by offering you an unobstructed sight, a brighter view and long-term use without fatigue. Small buckle design makes the monocular telescope easy to carry. The rubber armor with strips makes it comfortable to use and keeps it from slipping out of your hand. ◆1.Wipe the lens with lens cloth attached to the telescope or other soft and clean cloths. ◆2.If there are some dust or stains on the telescope, please dip a few drops of alcohol on the clean cloth to wipe it off. ◆3.Please keep in a ventilated and dry place. ✔NEW TECHNOLOGY:Thins is a material of high refractive index, which can effectively avoid dark corner and make images become clearer and brighter. FMC multi-layer broadband green film is coated with high transmission optical film for a better image, contrast and quality. ✔52 MM BIG OBJECT LENS: This object lens with objective diameter 52mm enables you to see the object more clearly and brightly. It can also broaden your view, perfect for bird watching, concert and sightseeing. ✔A NEW FUNCTION-COMPASS INSTALLATION: A compass is mounted on the side of the telescope so that you won't get lost during the trip. It is no doubt an outdoor survival guide for a safer journey. 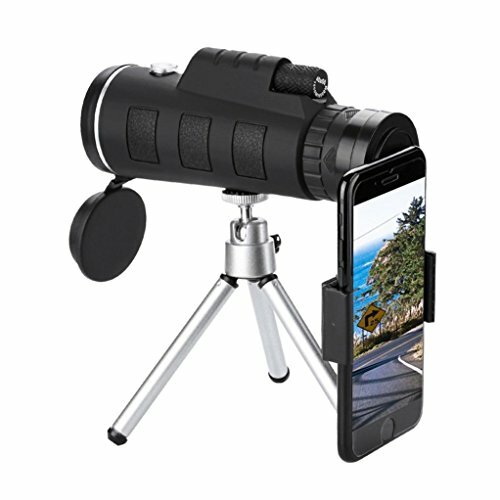 ✔EXTENDABLE TRIPOD AND ADJUSTABLE PHONE CLIP: This extendable tripod is made from aluminum alloy, which resists shake and enables hand free viewing. It also comes with an adjustable phone clip that helps you put your phone on it to get HD images easily. If you have any questions about this product by YRD TECH, contact us by completing and submitting the form below. If you are looking for a specif part number, please include it with your message.